Are you someone who has tried everything and still can’t find relief from lower back pain? Have you been wondering why your back pain isn’t getting better? Research indicates that quality of sleep plays a crucial role in improving outcomes in chronic pain patients. According to a few significant studies, a staggering number of chronic pain physical therapy patients (40-50%) feel better with just one single intervention: improving sleep hygiene. What can you you do about it? In addition, if you are a stomach sleeper you may want to reconsider. Sleeping on your stomach can hurt your back because this position can cause shearing of your spine, especially if you have tight hip flexors. Slide a thin pillow under your hips to alleviate pressure on your lumbar disks, ligaments and muscles. To further improve quality of your sleep, establish a regular routine, clear your mind before going to bed, and improve your sleeping environment by keeping your bedroom neat and organized. Research indicates that there is a strong correlation between chronic back pain and smoking. The reason is simple: nicotine constricts blood vessels which causes poor blood flow and increases inflammatory response/acidity of tissues. All of these are impairing tissue healing (if injury is present), and trigger early degeneration of joints and cartilages (even in absence of the injury). As a result, back pain is more common in smokers and poor treatment outcomes are more frequent in smokers then non-smokers. Thus, consider quitting your smoking habit to improve your chance of healing in your back pain. An average person spends about nine hours every day using electronic devices to work, communicate or socialize. A Temple University study suggests that texting is responsible for increased neck, shoulder and back pain. We have all heard that sitting all day long is not good for you. 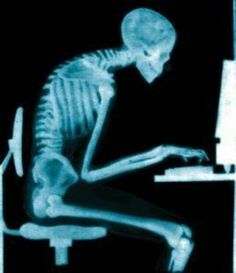 Sitting all day long with poor posture is even worse. Prolonged sitting alone will cause muscle weakness and tightness, and sitting with poor posture will also cause discs protrusion, joint dysfunction and mechanical pain. It is not uncommon for people struggling with chronic pain to develop depression. But now researchers are discovering that the reverse may be true as well. In research from Alberta in Canada, people with major depression are four times more as likely to develop disabling low-back pain and neck pain. Some scientists believe that poor coping skills related to depression, such us withdrawing or avoiding problems, may trigger the release of stress hormone cortisol, causing increased inflammation and tension. The result is a devastating cycle of back pain and depression. Antidepressants, as well as mood enhancers like exercise, meditation, yoga, and deep breathing, can help ease stress and improve your overall wellbeing as well as make your back feel better. Finally, if you are receiving the treatment for back pain and symptoms are not getting any better, you have to consider the possibility that you are not getting a complete package. Back pain treatment is very complex and has to include comprehensive evaluation to determine root causes and related impairments, as well to assess posture, identify aggravating factors and work related and life habits. The right treatment is targeting the root issue, and not just chasing symptoms, giving fast and long lasting results. The best plan of care for low back pain is the one addressing all issues( pain, joint dysfunction, tightness, stiffness, and weakness) and in the right order. Absence of comprehensive treatment very often leads to poor results. Treatment such as massage therapy without core strengthening, stretching without strengthening, strengthening without correcting alignment, simply does not work. Do not trust your back to just anyone. Look for a hands on provider with excellent diagnostic skills, knowledge, experience and a compassionate heart. Now you should know a few common reasons why your back pain isn’t getting better. If you continue to have symptoms, remember that we are back pain specialists at Physio Physical Therapy and offer special packages to make the fast and effective treatments affordable. Give us a call today if you are suffering from back pain, before it is too late. We would love to help!